Interesting things happen near borders, where cultures merge organically and children who straddle societies come up with ideas that confuse their elders. Sometimes this is deliberate, as a counterculture finds ways to dress, talk, and cook that stakes a claim to being different. In the 1930s hipsters along both sides of the Mexican border were called pachucos, and they developed a dialect that set them apart, an oblique, poetic slang that they called Caló. The mix of English and Spanish was named after a gypsy language and was studded with archaisms, invented words, and rhyming nonsense. It was intended to be as impenetrable and annoying to adults as rapper slang is today, and by all accounts it succeeded. Caló Kitchen opened a few months ago in El Segundo. You might imagine an interior filled with period furniture and pictures of pachucos in zoot suits. I’d find such décor delightful and in keeping with the edgy spirit of Caló, but it’s not what’s been done here. 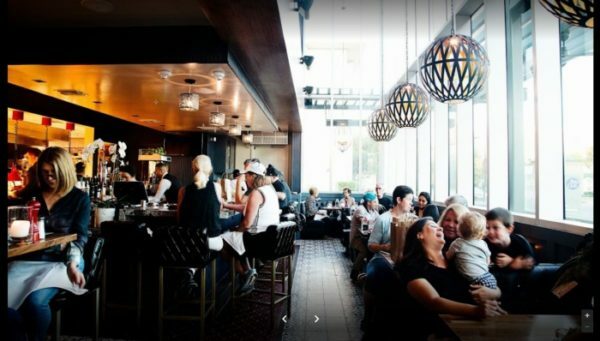 Instead the restaurant in the Apollo Landing development on Rosecrans is decorated in modern style with mid-century touches in the lighting and colors. On multiple visits the music was Cuban rather than Mexican, which is strangely fitting. The sound level is moderate, and on one visit when it was a bit loud they lowered it on request. The environment is stylish and not at all what you’d expect from a restaurant by an office complex. The menu isn’t confrontationally odd either, but there are hints throughout that things are done a bit different. 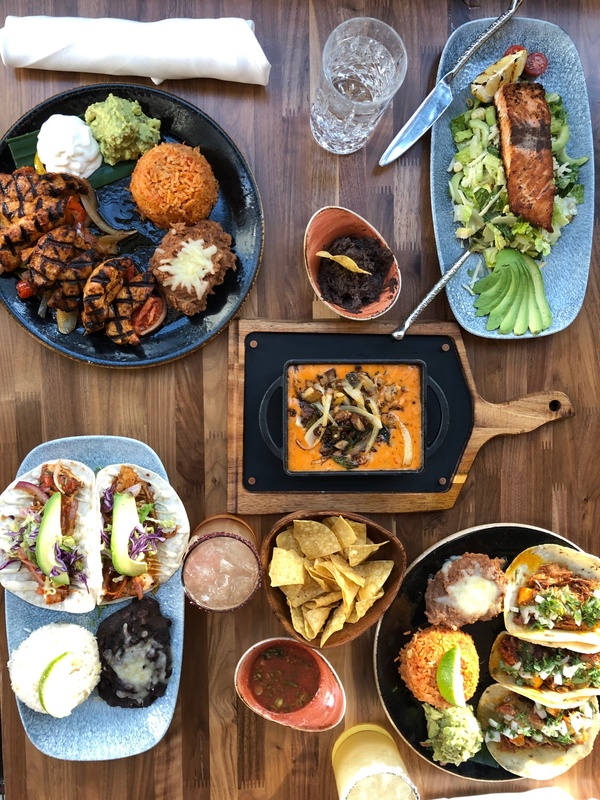 The carnitas is made with prime kurobuta pork, the pollo serrano with organic jidori, and they offer a few novel items, such as a shrimp and bacon taco and short rib enchiladas with crisped onions. When you see plates going by, they look particularly appetizing. There’s a lot of food on each platter, and it’s presented with more care than usual. Calo servings are colorful and plentiful. 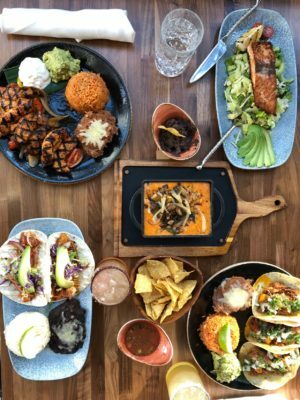 Among them are halibut fish tacos, chicken fajitas, grilled salmon salad and the Tampiquena pork -pineapple Tacos. While you eye that menu you’ll be offered warm chips with salsa and a small pot of spiced hot beans for dipping. If you’ve ever caught yourself eating a whole basket of chips just because the salsa was good, wait until you try these. The salsa is nice and medium-spicy, but the beans grab your attention. They’re fragrant and have just a little heat, definitely not the bland, neutral side item that you’d expect. Since I had some idea of the portion sizes I’ve tried only a few starters: guacamole, shrimp taquitos, and a “charred quesadilla salad.” The guac was just fine, but the shrimp taquitos won hands down. Large prawns are wrapped in tortillas and fried, then put over a few salad leaves and topped with a mix of onion, cheese, pico de gallo, and a salsa quemada made from roasted tomatoes with garlic. In case that isn’t enough flavors jostling for attention, there’s a side of the house spicy aioli. I half wished that the salsa quemada had been on the side so I might have explored the flavor with some chips, but the starter was superb just as it arrived. It would take a lot of willpower not to order this as a main course on our next visit, or at least have it as a starter again. Instead I ordered the quesadilla salad, mostly out of curiosity about what it could possibly be. It was the only disappointment of three visits, not because it was bad but because it was ordinary. It was a fairly standard salad of lettuce, corn, and beans with a decent house-made ranch dressing that had been topped with a quartered quesadilla. The tortilla had evidently spent a brief time over a fire because there were faint grill marks, but this hadn’t added any char flavor. Given how good everything else was, I’d advise you to give this one a miss and try something else. The pork tamales are a departure from tradition. They’re topped with cheese and salsa rather than straight from the cornhusk. I’m of two minds about this – I liked all those flavors mingled together, but next time I’m likely to order it without adornment so I can just savor the simple flavors of the traditional item made exceptionally well. When you order a combo plate you’re offered the option of rice and beans or Mexican corn. I strongly suggest you go for the corn. The whole ear spends enough time on the grill to get a bit of char and then is topped with aioli, cheese, and a sprinkling of chile-lime powder. It’s messy to eat and probably not terribly good for you, but every calorie and shirt stain is worth it. The shrimp and bacon taco are exactly what you’d expect when you put two of the most popular foods in America together – smokiness and crunch balancing moist richness and mild seafood. Add some judicious seasoning, wrap it in a housemade tortilla with some onion and peppers and a little cream sauce with a dash of chile, and it’s irresistible. The lobster enchilada was another chance to enjoy that tomatillo sauce with seafood, and the crab and lobster relleno was another surprise. Having had the relleno filled with meaty carnitas first I wondered if the milder seafood would be lost in the flavors of green pepper and sauce, but it worked. A larger portion would have been overwhelming, but I was engaged with the flavors for the exact right amount of time. We paired the seafood sampler with two Mexican Chardonnays, a Lechuza and a Corona del Valle. The aromatic, lightly fruity Corona in particular paired best with the seafood, but both made a case for investigating more Mexican wines. The wine list is short because their focus is on tequila, of which they have a decent selection. 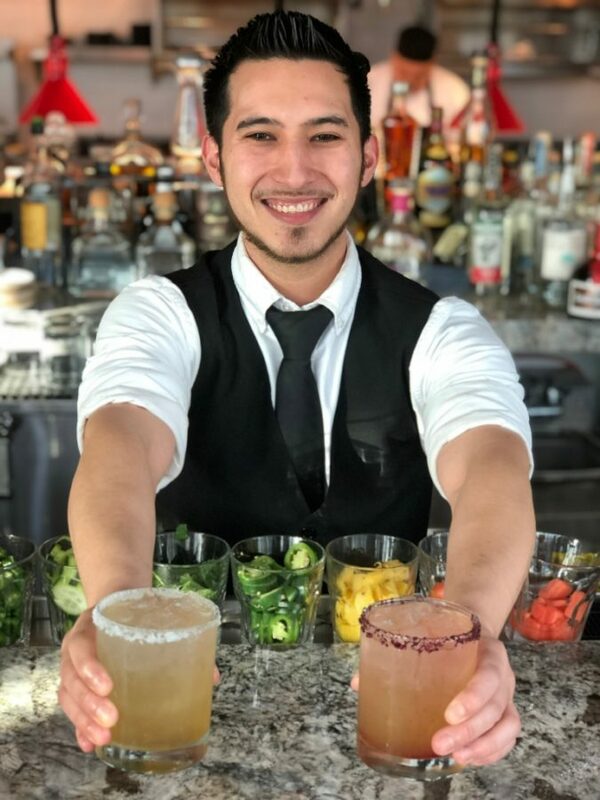 Their bar here is small and cramped so that the two bartenders are dodging servers and each other on a regular basis, but they manage to turn out some good cocktails in spite of a challenging environment. The grilled pineapple and chile margarita was probably the best spicy margarita I’ve had, and the Sandia cocktail with watermelon, lime, agave, and fresh basil is the kind of drink I’ll crave as a summer cooler. Ice cream or caramel-filled churros are offered for dessert, but we didn’t have room on either trip, and anyway I prefer my churros with chocolate. I’ll probably give these a try some time, because I will be back to sample more of the items on this menu. Caló Kitchen is a remarkable addition to Rosecrans, and I know that one of these times when I’m driving down the avenue near lunch or dinner time the car is going to take me there of its own accord.